The number of uninsured adults dropped for the first time in 2014, according to a new report by the Commonwealth Fund. In addition, for the first time, fewer adults reported difficulties paying medical bills, had medical debt and delayed care because of the cost of care. An infographic by the Commonwealth Fund examines these trends over time. From collaboration and consolidation to the inevitable acceptance of a value-based system, the state of healthcare continues to stimulate health plans, providers and employers. Healthcare Trends & Forecasts in 2015: Performance Expectations for the Healthcare Industry HIN’s eleventh annual industry forecast, examines the factors challenging healthcare players and suggests strategies for organizations to distinguish themselves in the steadily evolving marketplace. There are a number of measures that could be used to evaluate the effectiveness of the Affordable Care Act, according to the Commonwealth Fund. To date, the ACA’s implementation has been associated with significant progress, reflected in a new infographic by the Commonwealth Fund. The infographic looks at the ACA marketplaces and health insurance enrollment and uninsured trends since the ACA’s implementation. Pursuing the Triple Aim: Seven Innovators Show the Way to Better Care, Better Health, and Lower Costs shares compelling stories that are emerging in locations ranging from Pittsburgh to Seattle, from Boston to Oakland, focused on topics including improving quality and lowering costs in primary care; setting challenging goals to control chronic disease with notable outcomes; leveraging employer buying power to improve quality, reduce waste, and drive down cost; paying for care under an innovative contract that compensates for quality rather than quantity; and much more. The authors describe these innovations in detail, and show the way toward a healthcare system for the nation that improves the experience and quality of care while at the same time controlling costs. The uninsured rates in states that did expand Medicaid has dropped substantially in comparison to the states that did not expand Medicaid, according to a new infographic by LifeHealthPro. The infographic looks at the top states with lower rates of uninsured post Affordable Care Act. Now that open enrollment is over, Public Exchanges Data: Premium Analysis and Carrier Participation for 2014 takes a look at how it all played out. This report offers a highly detailed overview of where carriers participated, the types of products they offered and how their prices stacked up against their competitors. The decision by some Southern states to not expand Medicaid under the Affordable Care Act will keep Medicaid eligibility levels low, according to a new infographic by the Kaiser Family Foundation. The infographic shows that Southerners are more likely than people living in other parts of the United States to be uninsured; that most Southern states have poverty rates above the national average; and details on the Medicaid coverage gaps in Southern states. To locate, stratify and engage dual eligibles, Health Care Services Corporation (HCSC) takes a creative approach, employing everything from home visits to ‘street case management’ to coordinate care for Medicare-Medicaid beneficiaries. Dual Eligibles Care and Service Planning: Integrative Approaches for the Medicare-Medicaid Population describes HCSC’s innovative tactics to engage this largely older adult and disabled population in population health management with support from a range of community partners and services. Medical bills cause more than 60 percent of bankruptcies in the United States, where healthcare is the most expensive in the world, according to an infographic from CauseWish. This infographic also identifies reasons why individuals are uninsured, shows average prescription spending per person and hospital spending per discharge, and shows the states with the highest uninsured populations. 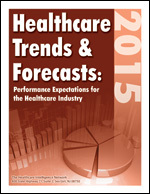 You may also be interested in this related resource: Healthcare Trends & Forecasts in 2014: Performance Expectations for the Healthcare Industry. 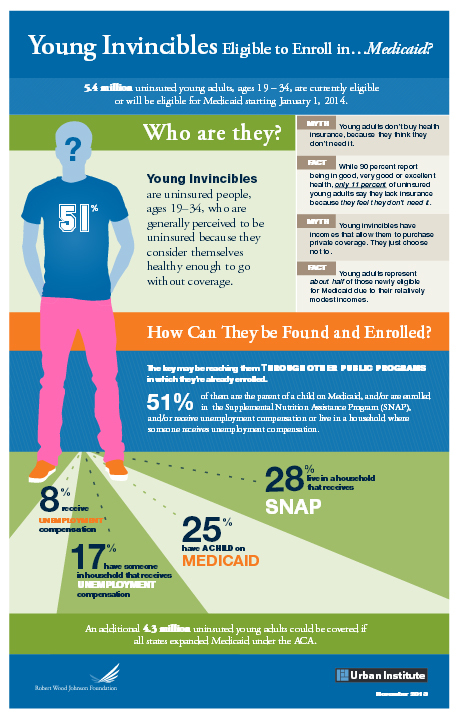 Infographic: Are Young Invincibles Eligible for Medicaid? Approximately 5.4 million uninsured young adults, ages 19 to 34, also known as ‘young invincibles’ are now eligible for Medicaid, according to a new infographic from The Urban Institute. This infographic also summarizes who the ‘young invincibles’ are and how they can be identified and enrolled in insurance plans. You may also be interested in this related resource: Next-Generation Insurance Benefit Design and Marketing. Posted in Affordable Care Act, Health Insurance Exchanges, Healthcare Reform, Healthcare Trends, Infographics, Medicaid | Comments Off on Infographic: Are Young Invincibles Eligible for Medicaid? Infographic: How Much Does a Hospital Stay Cost? Approximately 18.4 million Americans had an overnight hospital stay last year, with an average stay of five days. Despite the treatment needed, the average price per visit was around $9,700. Still, the cost is considerably different for those who are insured versus those who are not, according to a new infographic from Intuit. This infographic details the specific costs for insured versus uninsured patients, as well as overall costs related to different insurance plans. You may also be interested in this related resource: Leading a Hospital Turnaround: A Practical Guide. Posted in Healthcare Costs, Hospitals, Infographics | Comments Off on Infographic: How Much Does a Hospital Stay Cost? Infographic: Will Your State Run a Healthcare Exchange? Every state must offer a healthcare insurance exchange by January 2014, under the Affordable Care Act. The Centers for Disease Control estimated there were 48.2 million people without insurance in 2011, according to a new infographic from Face the Facts USA. The infographic describes how many individuals will be insured through healthcare exchanges, health plans that must be offered and assistance that will be available. Posted in Affordable Care Act, Health Insurance Exchanges, Healthcare Reform, Healthcare Trends, Infographics | Comments Off on Infographic: Will Your State Run a Healthcare Exchange? Addressing what families and caregivers consider to be most important during a hospital stay is the impetus behind a new guide from the Agency for Healthcare Research and Quality (AHRQ). The Guide to Patient and Family Engagement in Hospital Safety and Quality provides four evidence-based strategies that hospitals can use to implement patient and family-centered care practices. Each strategy includes educational tools and resources for patients and families, training materials for healthcare professionals and real-world examples that show how strategies are being implemented in hospital settings. The strategies describe the ways patients and families can work more effectively with hospital staff, including promoting patient engagement and better communication at the bedside to improve quality. Patient engagement is one of five key components when creating a patient-centered medical home (PCHM) model, as we discuss in two of our stories this week. If you don’t focus on engaging your patient in the model, it simply won’t be as successful as expected, explains Jay Driggers, director of consumer engagement at Horizon BCBS-NJ. Four other components, including payment reform, round out this story. Health centers have gotten a payment boost to guide uninsured Americans toward affordable health coverage, according to the Department of Health & Human Services (HHS). The agency has allocated $150 million in grants to 1,159 health centers to help them with enrollment assistance. Health centers are expected to hire an additional 2,900 outreach and eligibility assistance workers to assist millions nationwide with enrollment into affordable health coverage. Of those already insured, Medicaid recipients in Michigan were the most satisfied with their healthcare coverage in 2012, according to a report from The Center for Healthcare Research & Transformation (CHRT), while those with individual coverage were the least satisfied. These findings predict how consumers may react once health insurance marketplaces go into effect in 2014. The survey, conducted with the Institute for Public Policy and Social Research at Michigan State University, found that those with individually purchased insurance had more negative experiences (61 percent) than those with other types of insurance. Their negative experiences related to services that were not covered by benefits, or having to pay out-of-pocket for services that cost above what their insurance would pay. This group was also the least concerned about losing their coverage. In comparison, Medicaid recipients were the least likely to report a negative experience with their coverage (41 percent) and yet were the most concerned about losing their coverage. Researchers attributed this to Medicaid recipients’ gratitude at having coverage, given their health needs. In terms of healthcare, one sector that’s already struggling, and has been for some time now, is African Americans. In 2012, 17.4 percent of non-Hispanic blacks were uninsured. Although this was lower than the 29.4 percent recorded for Hispanics, it was much higher than the 11.2 percnet tallied for non-Hispanic whites. More critically, only 55.9 percent of African Americans are expected to continue to live in good health, while a more or less healthy life is expected in 69.4 percent of white Americans. This infographic from the Finances Online Web site takes a closer look at the health insurance situation of African Americans: their general health profiles compared to other ethnic groups; the insurance status of income groups within the African American sector; and where uninsured African Americans are clustered around the country.